Police search for weapons continue after firebomb thrown at police station on the Temple Mount. The police summarized the violent incident that took place at the Temple Mount Tuesday afternoon when Arab rioters threw a firebomb on the holy site. The incident took place around 1 pm, when a number of suspects arrived at the police station on the Temple Mount and threw a Molotov Cocktail at the station. Police at the scene identified and arrested the suspects. The police station was damaged and a policeman was slightly injured from smoke inhalation and was evacuated to medical treatment. The commander of the Jerusalem district, Major General Doron Yedid, ordered the removal of all the people who were on the Temple Mount and closed the site, in order to carry out operations and search for additional weapons. During searches on the Temple Mount, the police found several containers containing flammable materials in various areas, as well as firecrackers and Molotov Cocktails. Over 10 suspects were detained and detained for questioning, some of whom linked themselves to the incident. The investigation and searches on the Temple Mount continue, the police said. 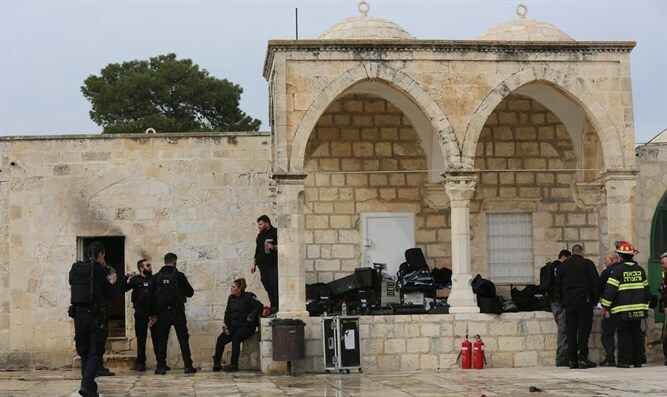 "The police forces are deployed in the area of ​​the Temple Mount and the alleys of the Old City and East Jerusalem in order to prevent any response to any attempt to disrupt public order in light of the grave incident that took place in the Temple Mount area," the police said.